Thank you for stopping to take a look at "Sandy Pants," located in the family friendly Mar Vista Grande at North Myrtle Beach. Plan your escape from overpriced, outdated condos equipped with tired furniture and poor internet signals. No cleaning the condo before you can unpack-just drop your bags, grab a cold beverage and head for the beach! Be sure to check out our reviews and learn why everyone who stays in one of our homes cannot wait to return. If this isn't quite what your are looking for, please consider our other property, "Blue Haven" (VRBO ID #1001013). This is a breathtakingly beautiful 3 bedroom, 3 full bathroom direct oceanfront residence in North Myrtle Beach's premier oceanfront high rise - The Mar Vista Grande. Spend your mornings watching the dolphins play in the beautiful Atlantic Ocean from the spacious balcony! This Club Floor Level unit has many upgrades, including cherry cabinetry throughout, granite countertops, stainless steel kitchen appliances, wood look ceramic tile floors, crown molding and nine foot ceilings, granite vanity in master bath along with an oversized glass shower with jetted tub in the master bathroom. Sit back, relax and enjoy the 65” Smart TV with DVR in the living room, the 50” Smart TV in the Master Bedroom, 40” Smart TV in Bedroom #2 and 32” Smart TV in Bedroom #3, all connected to a dedicated WI-FI signal in the condo! We completely remodeled this unit recently and replaced every stick of furniture. Simply put, you will not find a nicer condo in the building. A fantastic array of amenities are located around the property at Mar Vista Grande. Soak up the sun at the outdoor pool and lazy river area, complete with plenty of lounge seating. Cloudy or cooler days are perfect for the large indoor covered pool area. There are Jacuzzis and a kiddie pool is also available. Grab a frosty beverage from A Hui Hou Tiki Bar (Hawaiian for 'Until we meet again'), the focal point of the outdoor pool area. If you're in the mood to be pampered, check out the full-service spa, offering beauty treatments and massages. There's even a kids club program offering fun activities for the little ones you bring on vacation! Debbie and I have been married for 17 years and we share a passion for our two Cavalier King Charles Spaniels (Ginger and Gunner) and our now teenage daughter. We found a way to merge our love of the coast and Debbie's passion for interior design and we are happy to offer our home to you an your family. Thank you for taking the time to get to know us and please let us know how we may be of assistance. In November of 2015 we completed a total overhaul of our condo, including new flooring, paint, mattresses, bedding, furniture, accessories, electronics, dishes, glasses, etc. We trust that you will sleep well on the new Kingsdown mattress sets and enjoy the sounds of the crashing waves as you relax on the balcony overseeing the Atlantic Ocean. It is truly our “little piece of paradise,” and we sincerely appreciate your interest in sharing it. Beautiful condo with picture perfect views!! This is a great condo! Clean, well decorated, and comfortable. The in-condo washer & dryer is a plus. The view is spectacular and you can see up & down the beach. The pool area was also very nice and clean. Will definitely stay here again. Beautiful condo, and excellent position on the beach. This condo was amazing, and made room for our while family. We had a terrific time. The in house laundry facility was a big bonus, and the pool areas were super clean. The team at the VBRO check-in office were very kind, too. Tracy made a point to refer us to local restaurants, and she went above and beyond to call us after we left the office with a restaurant referral that caters to people with food allergies! That was absolutely amazing for my son and his fiancée. Although we cooked a lot in the condo, it was nice to have that insight to restaurants in the area. Thank you for that!! Possible suggestions for the future would be beach towels, chairs or mats for the beach, and perhaps spices/cooking oils/cooking spray. The condo is beautifully decorated and really comfortable. The resort pools are awesome and I would definitely stay here again. This was our second stay at this condo and we liked it even better this time! It's beautifully decorated, comfortable and offers all the amenities. Mar Vista Grande is top notch! Owner is exceptional to work with. Our family has stayed in this condo twice in two years and it’s beautifully decorated, very well furnished and extremely well kept and clean! The owners are a pleasure to work with and answer any questions quickly. Highly recommended. Beautiful condo, you will not be disappointed!! This is such a beautiful condo!! The decor and unit holds very true to the pictures. It is extremely clean and well stocked. It's just the right mix of luxury and feeling right at home. Chad is incredibly responsive, and communicated with us before, during, and after our stay. We absolutely loved our Christmas stay here at the Mar Vista, and have already booked again for 2019!! Enjoy your next Grand Strand vacation at the beautiful Mar Vista Grande Resort, recipient of the prestigious AAA Four Diamond rating! Breathtakingly beautiful 3 bedroom, 3 full bathroom direct oceanfront residence in North Myrtle Beach's premier oceanfront high rise - The Mar Vista Grande. 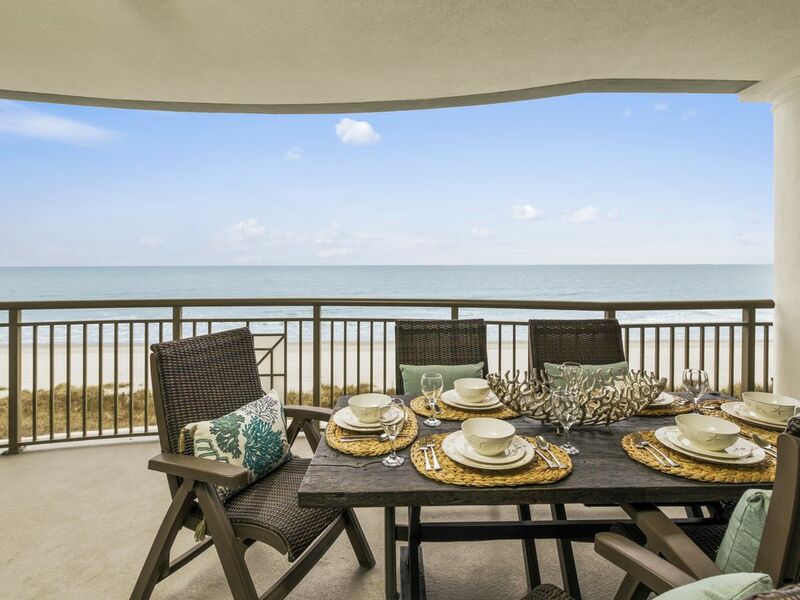 Enjoy spectacular views of the rolling Atlantic Ocean from the spacious balcony! Club Floor level unit with many upgrades, including cherry cabinetry throughout, granite countertops, stainless steel kitchen appliances, ceramic tile floors, crown molding and nine foot ceilings, granite vanity in master bath along with an oversized glass shower with jetted tub in the master bathroom. Sit back, relax and enjoy the 65” Smart TV with DVR in the living room, the 50” Smart TV in the Master Bedroom, 40” Smart TV in Bedroom #2 and 32” Smart TV in Bedroom #3, all connected to the complimentary WI-FI! We completely remodeled this unit in October of 2015 and replaced every stick of furniture. Simply put, you will not find a nicer condo in the building. A fantastic array of amenities are located around the property at Mar Vista Grande! Soak up the sun at the outdoor pool and lazy river area, complete with plenty of lounge seating. Cloudy or cooler days are perfect for the large indoor covered pool area. There are Jacuzzis and a kiddie pool is also available. Grab a frosty beverage from A Hui Hou Tiki Bar (Hawaiian for 'Until we meet again'), the focal point of the outdoor pool area. If you're in the mood to be pampered, check out the full-service spa, offering beauty treatments and massages. Guests receive complimentary DVD rentals and each guest receives one adult admission ticket to one of the popular area attractions at arrival (attractions vary based on season). There's even a kids club program offering fun activities for the little ones you bring on vacation! Cancellations less than 30 days from check in date will receive a 50% refund of payments made.